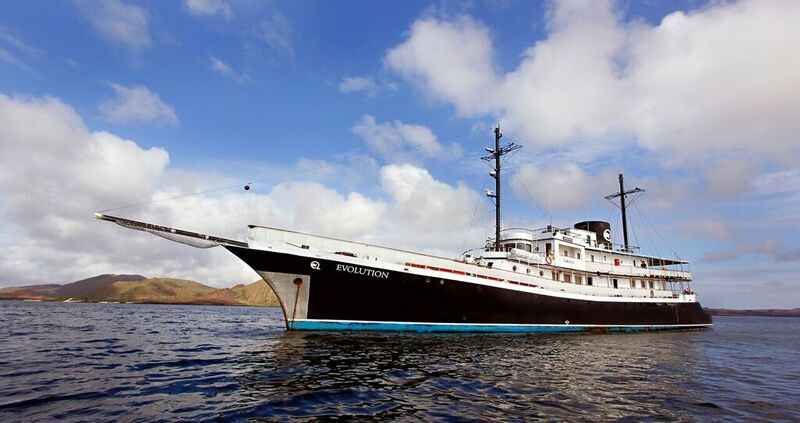 With Quasar Expeditions, one of the most experienced names in Galapagos luxury cruises for over a quarter century, you will encounter giant Galapagos tortoises, prehistoric marine iguanas and unique species of penguins, flightless cormorants and pink flamingos up close and personal. What is Quasar Expeditions all about? Quasar Expeditions has carefully selected only the most knowledgeable, professional and friendly naturalists in the region, with an average of 15 years of experience guiding on the Islands. Their naturalists are professionals who will provide you with all the information you want to know about the wonders you will discover every day. They are also all very well versed in safety and first aid so you know you are in great hands while on your Galapagos travel adventure. Their Galapagos naturalists are experts who are there not only to show you and tell you about nature, but to immerse you in it so that you can greater appreciate and cherish your exploration. When visiting the Galapagos Islands for one week there are trade-offs regarding the landing sites you can and can't see, in a place where one can encounter as great a variation crossing from one side of a bay or island to another, as traversing the entire archipelago. This has always been the case. 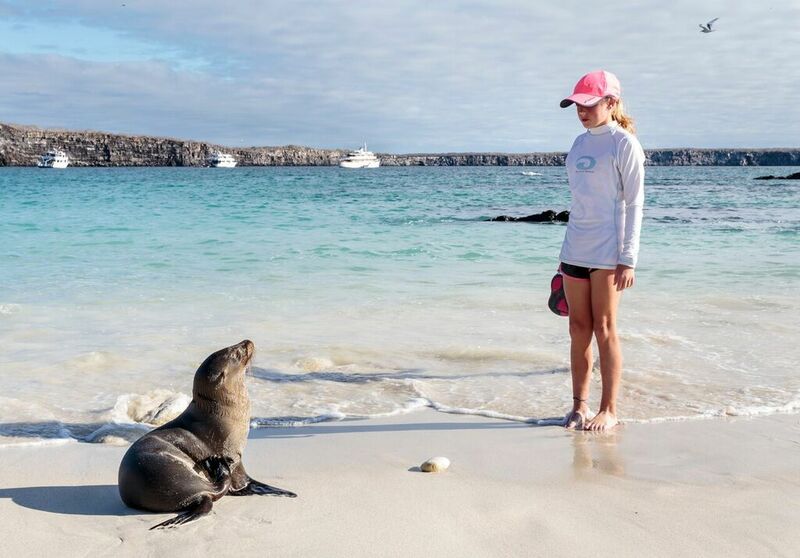 Recently the Galapagos National Park decided to reduce the environmental impact on its 40 + visitor landing sites by requiring that yachts wait 14 days before returning to a given National Park visitor site. 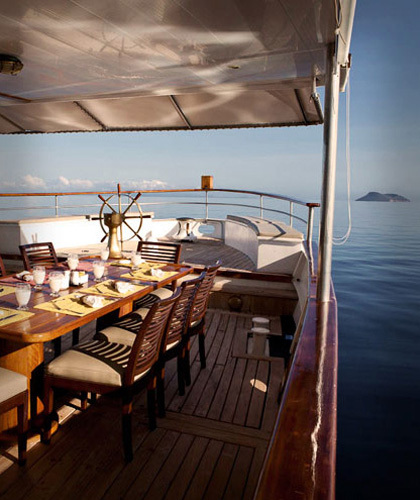 As a result of this ruling each of their yachts operates two different week long itineraries. These 8 day / 7 night itineraries run Saturday-to-Saturday and alternate each week. Through their complete itineraries, guests are able to see all of the Galapagos wildlife that made the Islands famous and inspired Charles Darwin’s theory of evolution. You can also combine these itineraries back-to-back to experience one, all encompassing two week long voyage. They have put a lot of effort into obtaining permits from the Galapagos National Park that allow their yachts to visit all of the most important sites on the Islands. 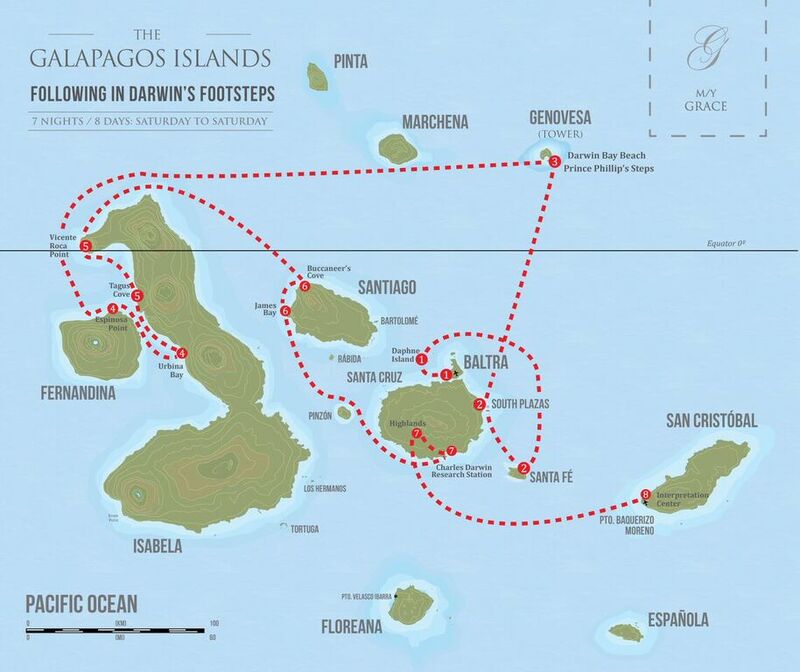 Many cruise operators on the islands avoid the long navigations to save costs, but they are firm believers that a true Galapagos experience involves visiting the most remote islands as well. 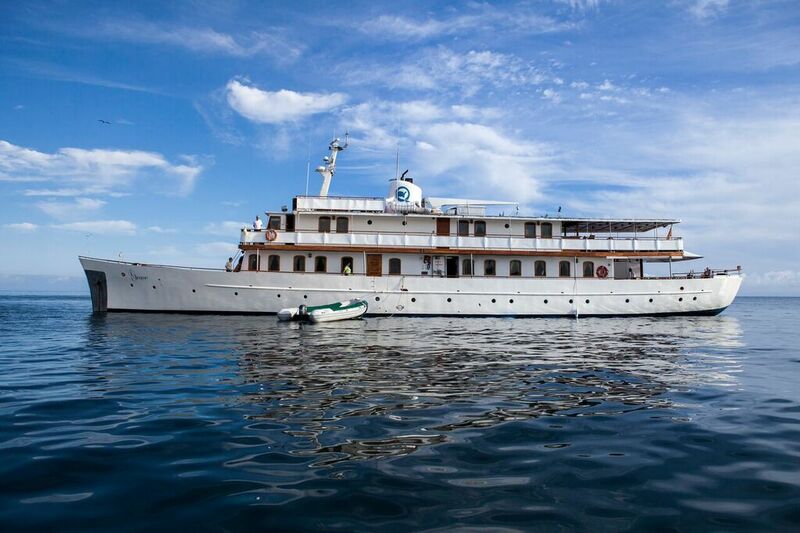 With Quasar you have two options for your cruising vessel; The M/V Evolution and The M/V Grace. 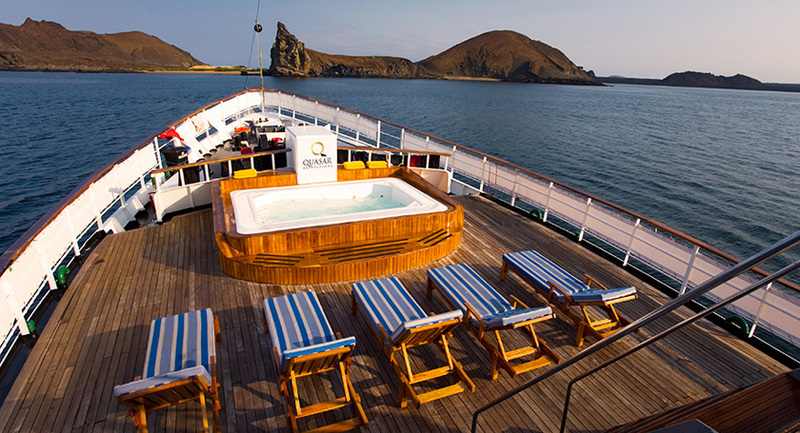 Both Yachts have two different itineraries offering a variety of activities across the Galapagos Islands. 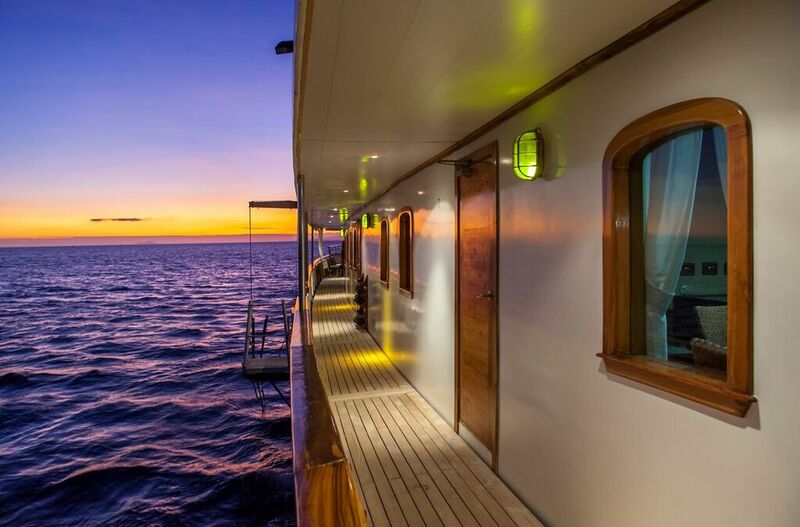 The M/V Evolution is the newer of the two yachts and allows you to experience the Galapagos as Charles Darwin did: privately and intimately. 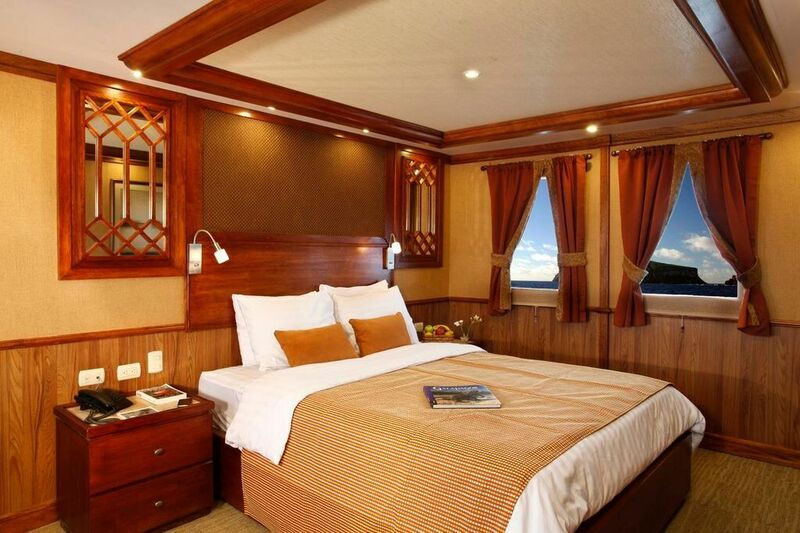 The Evolution has room for 32 guests and has 3 suites, 9 premium staterooms, and 4 deluxe staterooms. 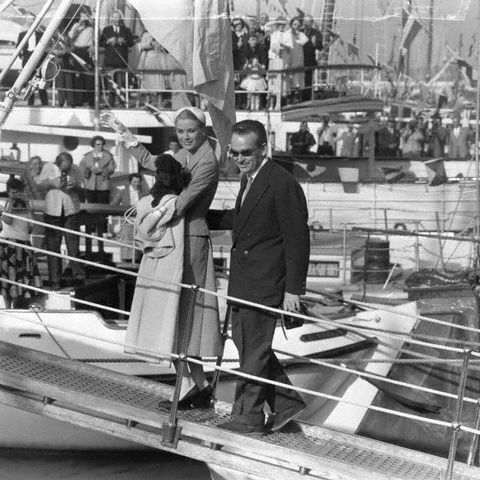 The M/V Grace is Grace Kelly's Royal Honeymoon yacht that has been with the company since 2007 and is their smaller private luxury ship. 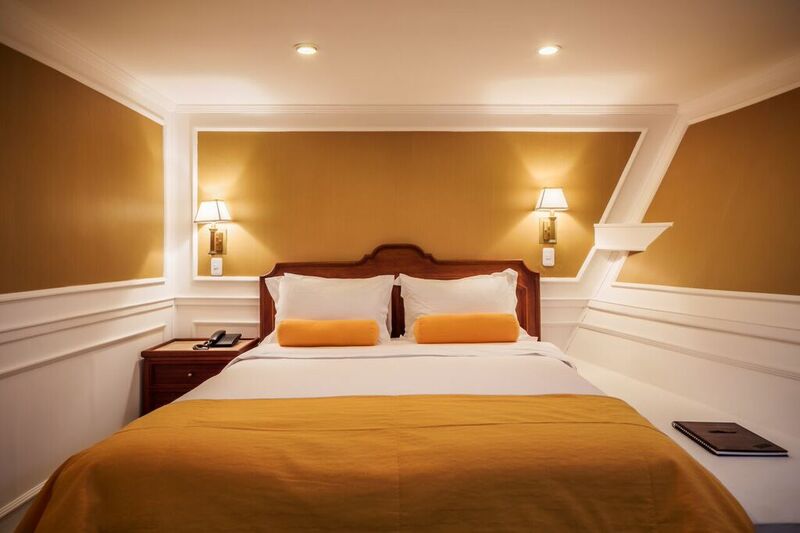 The Grace has room for only 18 guests and has 4 suites and 5 premium staterooms. 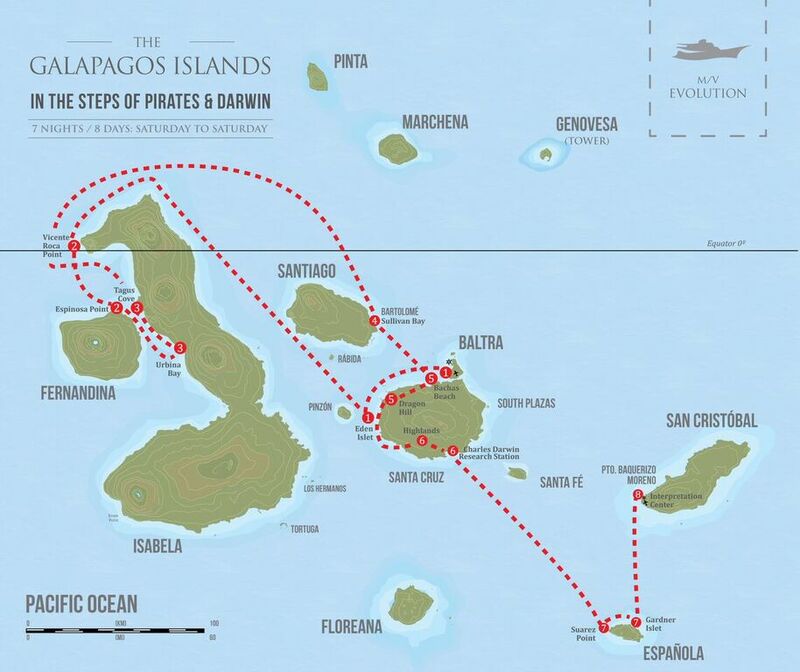 Evolution Itinerary - From Baltra Island: "In the Steps of Pirates and Darwin"
Saturday: In the morning you arrive on Baltra Island where you will board the ship. In the afternoon you get the chance to explore the Daphne Major Islet. Sunday: In the morning you get to snorkel the waters around Punta Vicente Roca on Isabela Island. 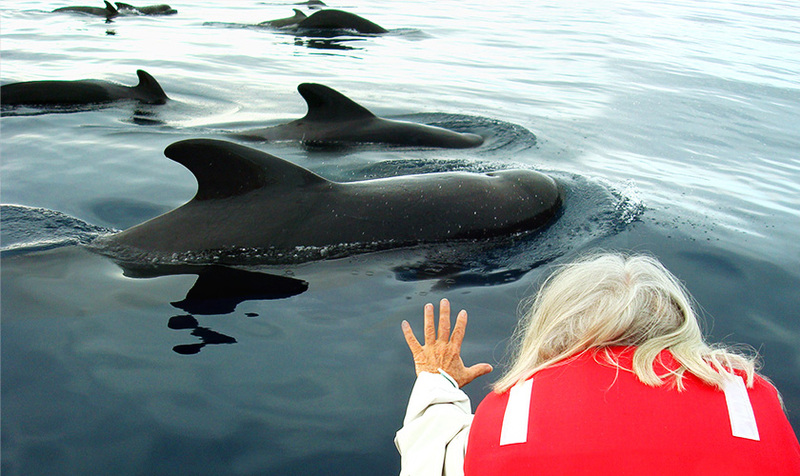 In the afternoon you will visit the volcanic island Fernandina and view some wildlife at Punta Espinosa. Monday: In the morning you will visit Urbina Bay on Isabela Island. In the afternoon you will sail up the coast to Tagus cove for a hike. Tuesday: In the morning you visit Bartolome Island where you will hike to see spectacular views of Pinnacle Rock. In the afternoon you have the opportunity to explore the most outstanding volcanic site in the Galapagos, Sullivan Bay on Santiago Island. 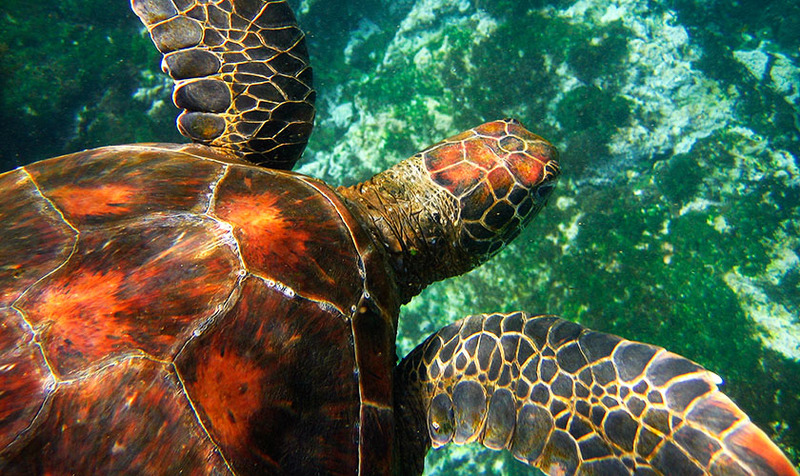 Wednesday: In the morning you will visit La Bachas Beach on Santa Cruz Island, a major sea turtle nesting site. In the afternoon you will hike through the forest of Dragon Hill. Friday: In the morning you will go wildlife watching at Punta Suarez on Española Island. In the afternoon you will visit Gardiner Bay. Saturday: In the morning you will visit the Galapagos National Park Visitor Centre on San Cristobal Island before disembarking and flying back to mainland Ecuador. 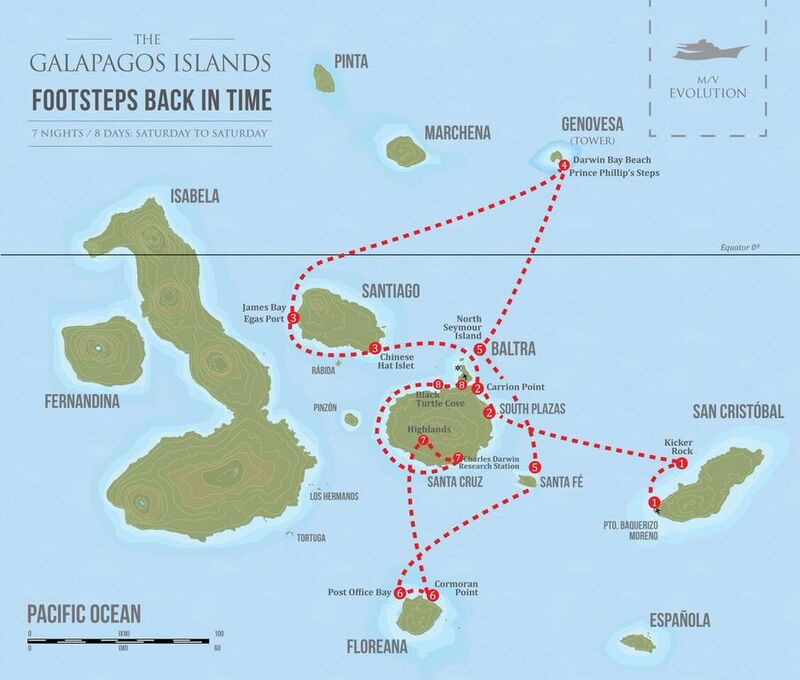 Evolution Itinerary - From San Cristobal Island: "Footsteps Back in Time"
Saturday: In the morning you arrive on San Cristobal Island where you will board the ship. In the afternoon you will visit your first site, Kicker Rock. Sunday: In the morning you will visit the wildlife on South Plaza Island. In the afternoon you have the opportunity to go snorkelling at Punta Carrion followed by a visit to Daphne Island. Monday: In the morning you will visit a fairly recent volcanic cone on Chinese Hat Islet. In the afternoon you will explore the black sand beach of James Bay on Santiago Island. Tuesday: Today you will visit Genovesa Island (also known as Tower Island) for some spectacular bird watching and hiking. Wednesday: In the morning you will do a wildlife viewing hike on North Seymour Island. In the afternoon during a visit to Santa Fe Island you will go snorkelling in one of the most beautiful and sheltered bays of the archipelago, a perfect spot to see magnificent Sea Turtles. Thursday: In the morning you will visit Post Office Bay on Floreana Island, where in 1793 British whalers set up a barrel as the island's Post Office, you may even send your own postcard! In the afternoon you will visit with the Flamingos at Punta Cormorant which is followed by some snorkelling at Devil's Crown. Friday: In the morning you will visit the Wild Tortoise Reserve in the Highlands of Santa Cruz. In the afternoon you will visit the Charles Darwin Research Station in Puerto Ayora, the economic centre of the islands. Saturday: In the morning you will have one final encounter with wildlife in Black Turtle cove before disembarking the yacht on Baltra Island where you will catch your flight back to the mainland. Grace Itinerary - From Baltra Island: "Following in Darwin's Footsteps"
Sunday: In the morning during a visit to Santa Fe Island you will go snorkelling in one of the most beautiful and sheltered bays of the archipelago, a perfect spot to see magnificent Sea Turtles. In the afternoon you will visit the wildlife on South Plaza Island. Monday: Today you will visit Genovesa Island (also known as Tower Island) for some spectacular bird watching and hiking. 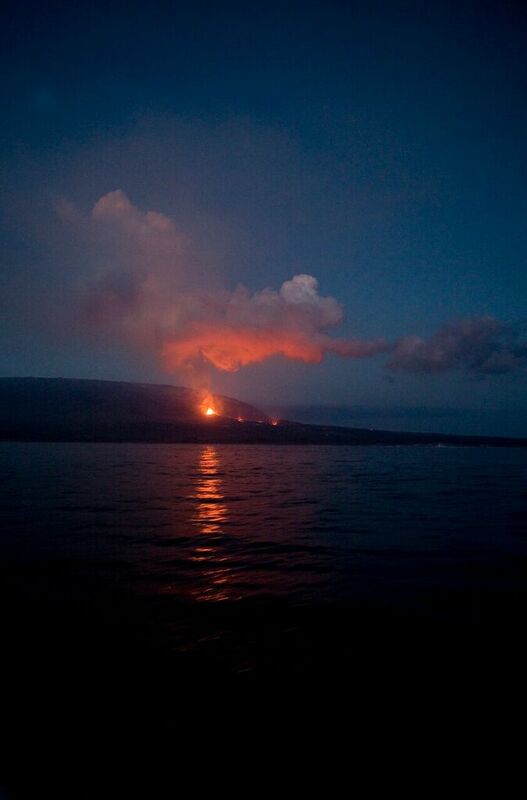 Tuesday: In the morning you will visit the volcanic island of Fernandina and view some wildlife at Punta Espinosa. 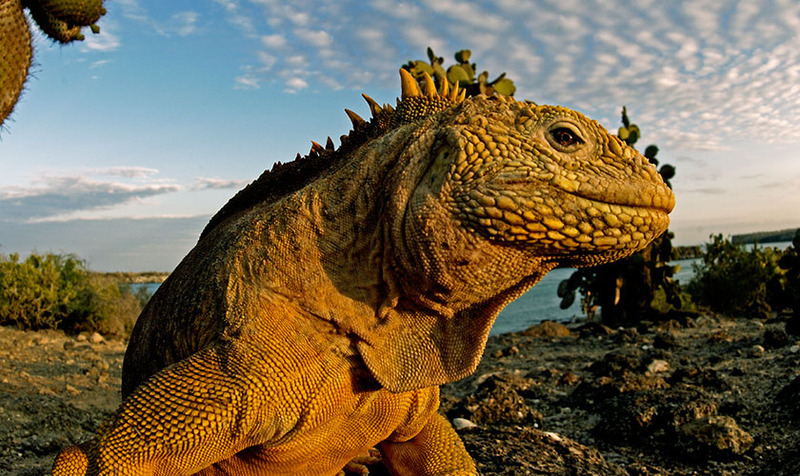 In the afternoon you will visit Urbina Bay on Isabela Island to view the amazing giant land iguanas. Wednesday: In the morning you will visit Tagus Cove on Isabella Island before heading of on a nature hike around Darwin Lake. In the afternoon you will get to snorkel the waters around Punta Vicente Roca. 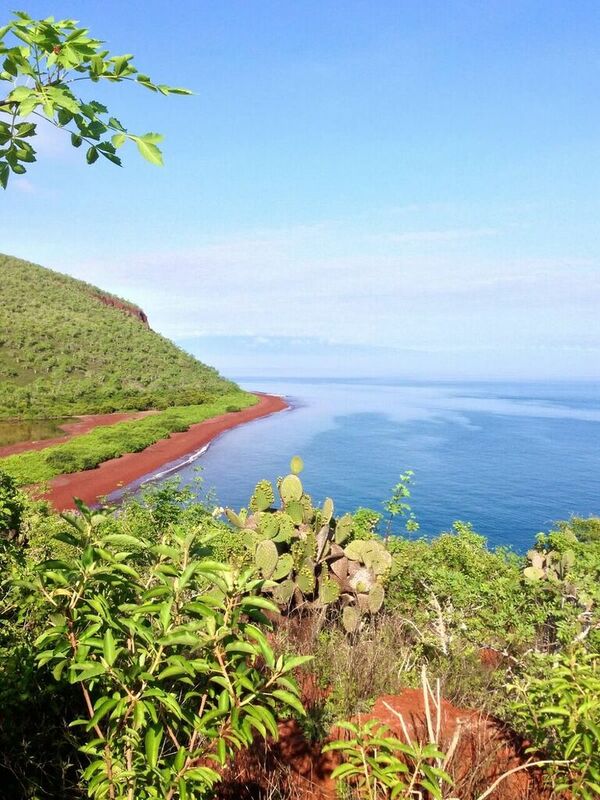 Thursday: In the morning you will explore Espumilla Beach and hike through Palo Santo forest on Santiago Island. In the afternoon you will explore the black sand beach of James Bay. Friday: In the morning you will visit the Charles Darwin Research Station in Puerto Ayora on Santa Cruz. In the afternoon you will visit the Wild Tortoise Reserve on the Highlands of the island. 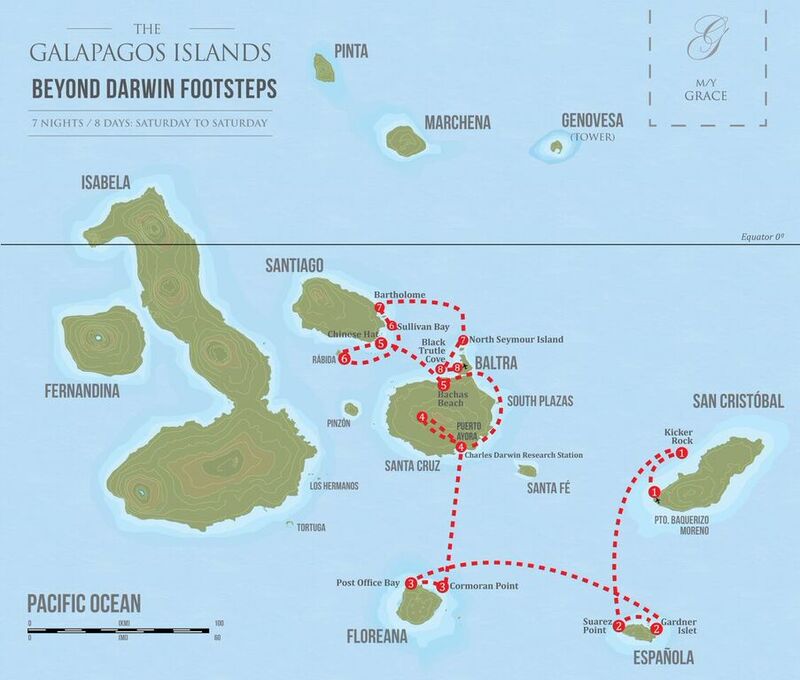 Grace Itinerary - From San Cristobal Island: "Beyond Darwin's Footsteps"
Saturday: In the morning you arrive on San Cristobal Island where you will board the ship. In the afternoon you will set out for your first destinations; sea lion watching on Lobos Island and the amazing rock formation Kicker Rock. Sunday: In the morning you will go wildlife watching at Punta Suarez on Española Island. In the afternoon you will visit Gardiner Bay. Monday: In the morning you will visit Post Office Bay on Floreana Island, where in 1793 British whalers set up a barrel as the island's Post Office, you may even send your own postcard! 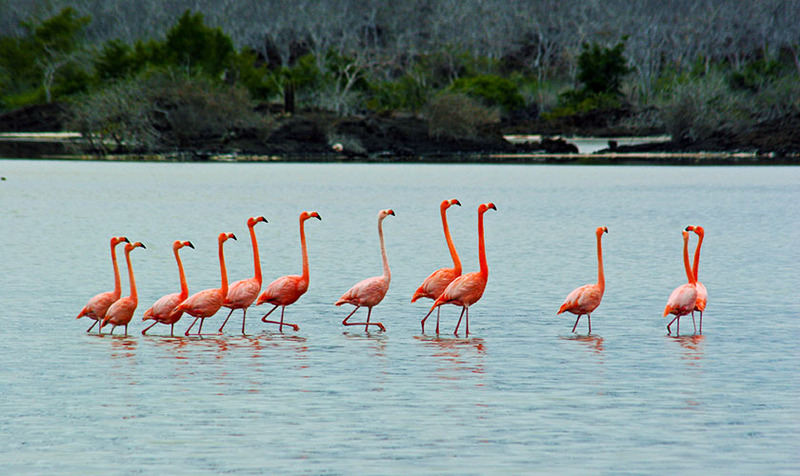 In the afternoon you will visit with the Flamingos at Punta Cormorant which is followed by some snorkelling at Devil's Crown. Tuesday: In the morning you will go on a nature walk around Dragon Hill on Santa Cruz Island. 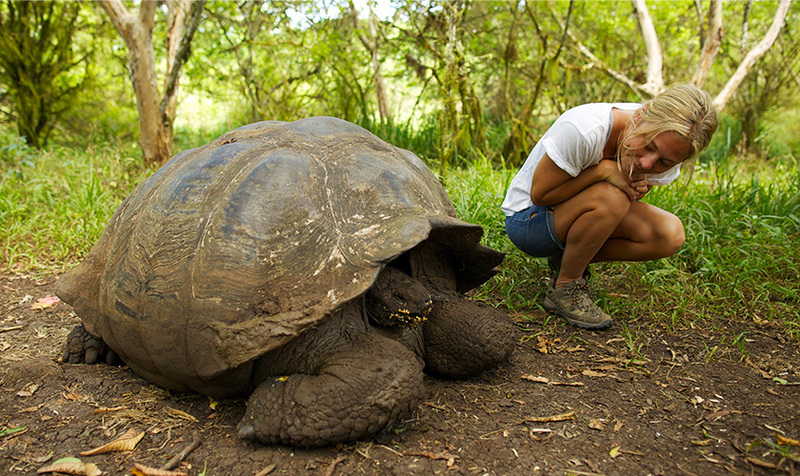 In the afternoon you will visit the Wild Tortoise Reserve on the Highlands of the island. Wednesday: In the morning you visit La Bachas Beach on Santa Cruz Island, a major sea turtle nesting site. In the afternoon you will visit a fairly recent volcanic cone on Chinese Hat Islet and get an opportunity to go snorkelling with sea lions and penguins. Thursday: In the morning you will visit the red sand beaches of Rabida Island. In the afternoon you will get to swim with sea lions in Sullivan Bay on Santiago Island. Friday: In the morning you will visit Bartolome Island where you will hike to see spectacular views of Pinnacle Rock. In the afternoon you will go wildlife viewing on North Seymour Island. 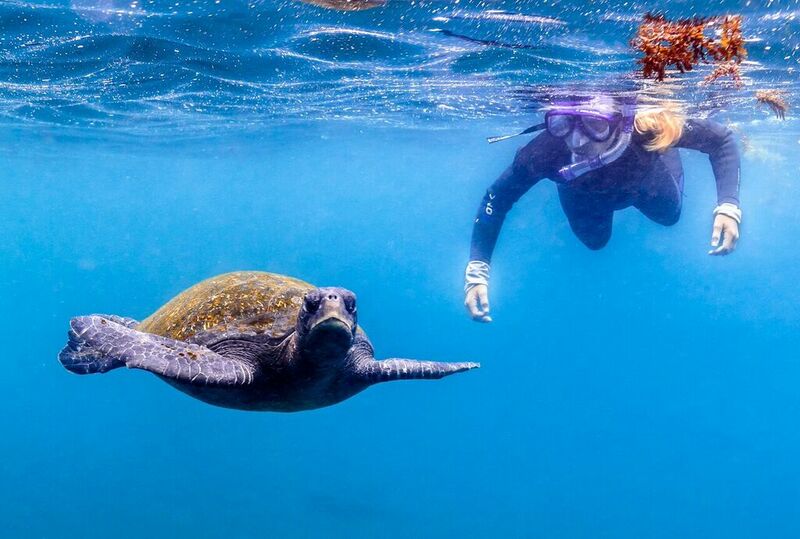 While in the Galapagos you will find that you are constantly active, doing nature hikes, snorkeling, swimming and sea kayaking all in an effort to get up close to the islands’ amazing animals. The way in which the Galapagos National Park has structured activities translates into the Galapagos not being a strenuous multi-sport destination centered on being rigorous. Instead, the Park has structured activities around interaction with wildlife and the habitat. 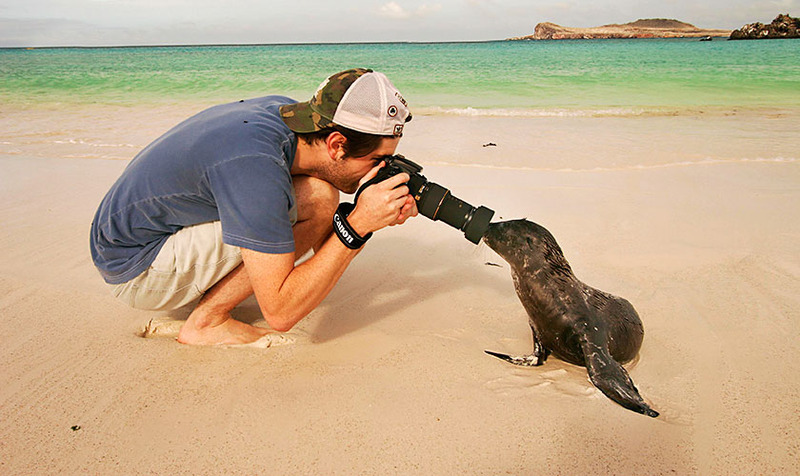 That is really what the Galapagos is all about. Quasar makes their trips more active by planning landings in places that offer better hikes like at Tagus Cove or to the top of Bartolome Island. They also offer itineraries that take in the more remote sites and outer islands, rather than staying solely in the more traveled inner islands. They maximize your opportunities to snorkel and kayak on each trip. They also offer opportunities for diving, for both advanced and intermediate divers. Why not treat yourself this coming year and embark on the vacation of a lifetime with Quasar Expeditions and North South Travel. You may reach one of our Travel Specialists by calling us at 604-736-7447 or by selecting the 'contact us' button!